CLEVELAND -- The chief executive of a beverage distribution company was piloting a plane carrying his wife, two sons and two other people when it quickly lost altitude after takeoff from Cleveland’s lakeshore airport and vanished from radar, according to his family and a flight-tracking service Friday. Superior Beverage Group executive John T. Fleming was piloting the Columbus-bound plane when it disappeared late Thursday about 2 miles over Lake Erie, his parents and company confirmed. The five other people on the plane were Fleming’s wife, Sue, teenage sons Jack and Andrew, a neighbor and the neighbor’s daughter, said John W. Fleming, the pilot’s father, and Joseph McHenry, an executive vice president at Superior Beverage. The U.S. Coast Guard announced it was suspending its search for the plane on Friday at 7:30 p.m., pending further developments. The Coast Guard is no longer expecting to find anyone alive. The search will have covered more than 128 square miles of Lake Erie, and it spanned more than 20 hours, the Coast Guard said in a statement. Crews combed Lake Erie for the plane on Friday. They were in search-and-rescue mode, not recovery mode, as they plied waters about 50 feet deep, said Mullen. The aircraft took off westward from Burke, then turned north across the lake, according to the tracking service flightradar24.com. The departure procedure at Burke could take an aircraft north over the lake before turning south toward a destination, Mullen said. The plane, which had made the roughly half-hour trip from Columbus earlier in the day, is registered to a limited liability company under the same Columbus address as Superior Beverage. Authorities have detected “faint hints” but no strong pulse from an emergency locating transmitter, a beacon that could help find the plane, Mullen said. Searchers have found no sign of debris. It was also “unlikely” that the plane landed somewhere else, an experienced helicopter pilot said, CBS Cleveland affiliate WOIO-TV reported. The search overnight was made difficult by snow squalls, high seas and darkness, Mullen said. Weather prevented smaller Coast Guard boats in the Cleveland area from launching. Weather in the area included 12-15 feet seas with winds around 30 knots, WOIO reported. It would have been the pilot’s responsibility to determine whether it was safe to fly, Mullen said. The search included Coast Guard crews aboard a helicopter, an HC-130 aircraft and the Coast Guard Cutter Bristol Bay. It also included aircrew aboard a Royal Canadian Air Force CC-130, the Coast Guard said. Searchers used night-vision goggles and some aircraft were able to search for heat signatures, Coast Guard petty officer Christopher Yaw said, WOIO reports. 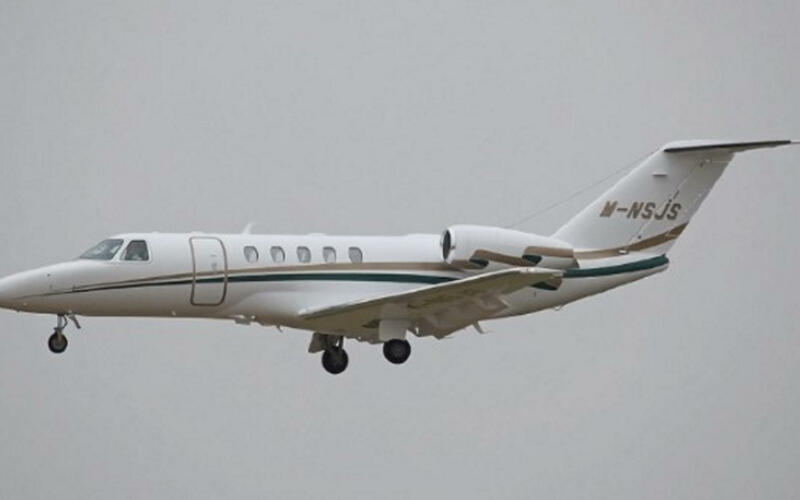 The Federal Aviation Administration said the Cessna Citation 525 plane left Burke at 10:50 p.m., and the Coast Guard said it was notified about the missing plane by air traffic control at Burke about 30 minutes later. Investigators from the FAA and National Transportation Safety Board were expected to arrive in Cleveland on Friday. The aircraft was headed to Ohio State University Airport northwest of downtown Columbus.